I have read on several other blogs about putting spinach in smoothies. When I first read this I thought what a great idea. What a great way to get some extra greens in my diet. This would be so healthy. But then I would think yuck, gross, how terrible, I would never do that. Well, I should never have thought that. I have been really trying to eat healthier, especially breakfast and lunch. As I have said before, I am not much of a breakfast and lunch eater. I am a snacker, but I am really trying to get better. 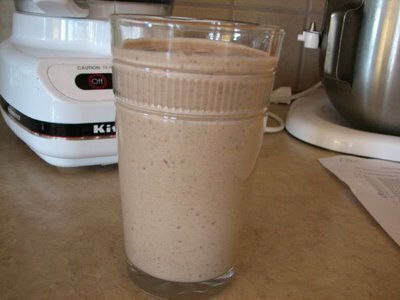 So, I have been eating a lot of smoothies for these meals and experimenting with what I put in them. I like fixing a smoothie for myself because I can make and eat it when I want. I can sip on it as I do other things. For me it is convenient. So, last week I had some fresh spinach that needed used up. I decided to put some in a smoothie. I really do not know why I decided to do this. I guess I was being adventurous that day. Especially since I don’t like spinach. I like it fresh in salad and occasionally cooked in a pasta type dishes, but overall I really dislike spinach. So, again I am not sure why I tried this. But do you know what? It was actually good. I really could not taste it. You could see it a little, but it really did not change the taste. It only made my smoothie healthier. I should add though that I did not use a lot. One tip though is to blend it really well if you put spinach in it. I don’t mind getting a small chunk of banana or other fruit in my smoothies, but chucks of spinach are not so nice in my opinion. So, now do you all think I am crazy for putting spinach in my smoothie or do you do this too? We do a lot of smoothies. It’s a great way to get my picky son to eat some healthy items, like yogurt. I have thought about sneaking in a little green in his smoothie, but I haven’t actually tried it yet. I have put spinach in brownies, and he couldn’t tell the difference. At first, I thought that sounded really weird, but then, I tried it, and the spinach was undetectable as long as I pureed the spinach before adding it to the brownie batter. Another post on putting spinach in smoothies, 11th Heaven mentioned it too! I had never heard of this, at least yours isn’t green so I think I’m more likely to try this version. Do you put ice in your smoothies at all? I know what you mean about the green. That is why I went light on the spinach. I put ice in mine if I have it. My icemaker on my fridge broke and I am bad about keeping ice in the trays. I think it gives it nice texture but I don’t always use it. I do use frozen fruit which works well. I think you could get by with it in a choc. shake. I wouldn’t try vanilla myself because I would have trouble getting pass the green. But that is just a personal thing. They give me energy, fill me nutrition, and help me feel awesome! I’ve never tried that. Here’s what I put in my smoothies. I think they are great–especially since I added walnuts. I totally make this too. It’s delicious!! Yes I have put spinach in my smoothies! I just recently bought a Vita-Mix blender and this morning I made a smoothie that consisted of red grapes, plain yogurt, a banana, handful of fresh spinach, pineapple, half an apple, small slice of cabbage, a few baby carrots, a bit of milk, some vanilla extract and a cup of ice. It was delicious! I had a couple of servings of fruits and vegetables before I ever left the house this morning! Try it with avocado. If you can handle the healthy fats, avocado make it thicker without adding any flavor. A person can puree avodaco or spinach and freeze them in ice cube trays. They can be thrown into a smoothie this way too. Can you freeze these smoothies as well? That was such an awesome idea.